In summer 2013 our eldest daughter went with us to Drachenwald Summer Coronation and 20th Anniversary. 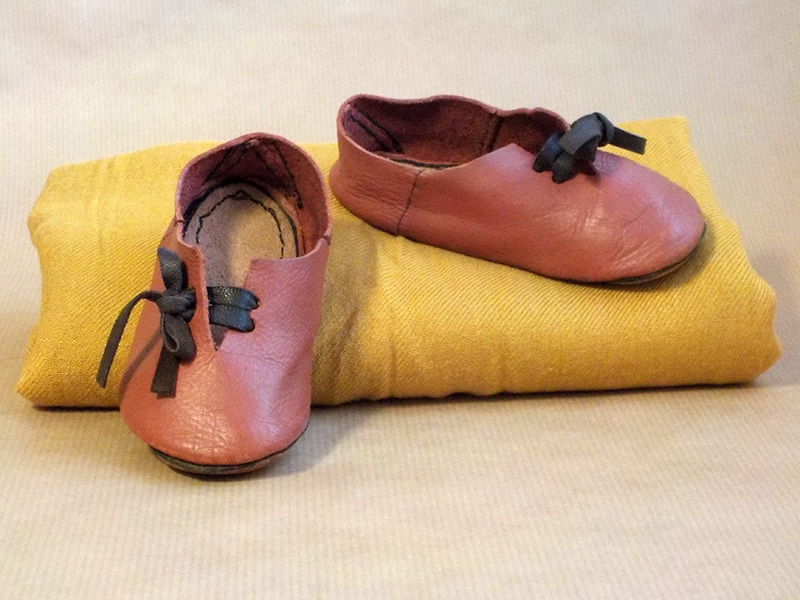 Besides sewing clothes for her I also made her a pair of turn shoes. 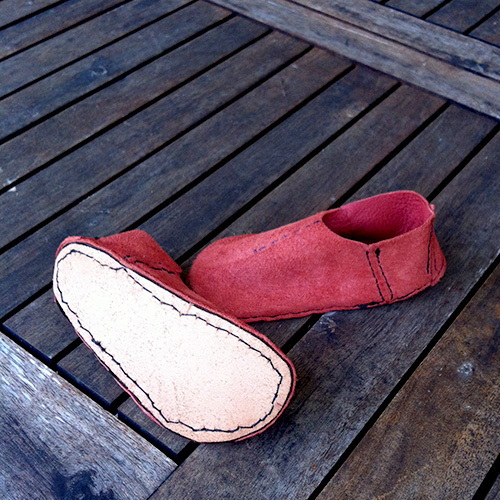 I’ve made turn shoes for myself previously but this was my first try making a pair of children’s shoes. I used this method for constructing the pattern and was fairly pleased with the result. It was a quick project so I took the time to sew hidden seams. Our 1,5 year old was not that interested in fitting the pattern so the shoe is a bit low at the ankle and slips of easily. Lesson learn for the next pair that I’ll make. For the upper I used an elk hide that I had in my stash, it’s to soft for adult shoes as it will stretch to much but it worked well for a children’s shoe. The sole came from a friends stash, a bit thinner than I would use for an adult shoe but I probably wouldn’t have been able to turn the shoe if the sole was thicker. 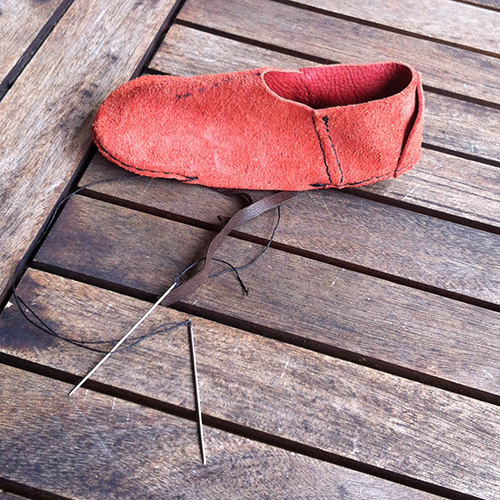 Sewing the upper to the sole. All the seams are done! 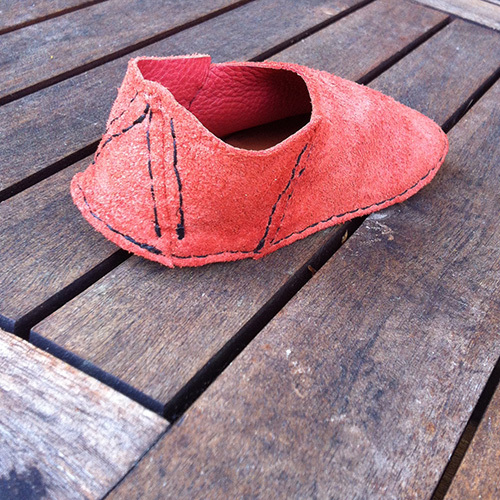 Wonky seams at the sole. 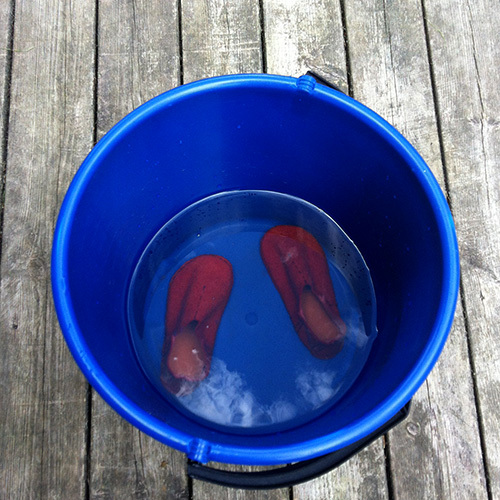 Soaking the shoes before turning them. We are going to Double Wars in May and unfortunately the shoes are already to small for our youngest daughter. But it was a quick and fun project so I look forward to making a pair each for them with improved changes. What is your experience with making and wearing turn shoes?